With Teamup Calendar, you can display any as a unique, stand-alone webpage. This event page can then be shared on social media with a click of a button. To create an event page, click on the Share button while viewing or editing an event. Or you can right-click on an event in your main calendar view, then select Share from the context menu. Next, select As page. An event page will automatically open. Learn more here. The leftmost buttons allow you to save this event to your personal calendar. On the right are the social media sharing buttons. Anyone viewing the event page can use the buttons to share the event on Facebook or Twitter. Note that images may not show up on your post preview if the picture is being shown on Facebook for the first time. Reload the preview window until the picture appears. Once your event has been posted, people can click the event link on the Facebook post to open the Teamup event page. The event page will have all the event details. Try it out yourself by clicking on the link in the Facebook post above. 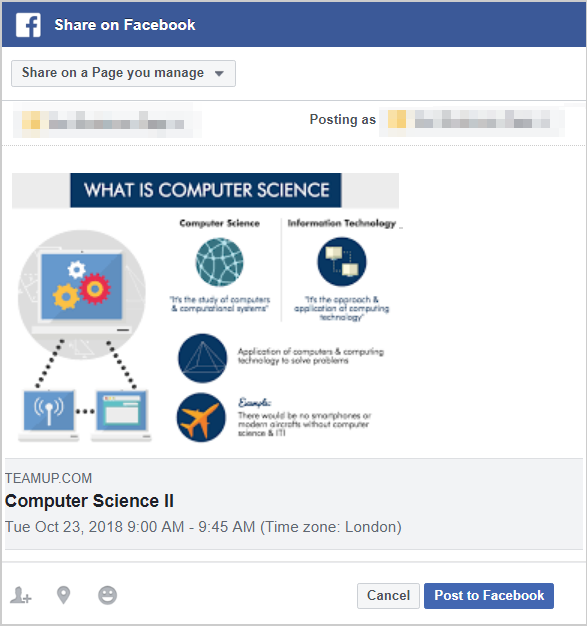 You can share an event page to your own Facebook timeline or to any Facebook page that you manage. Of course, you can also post the event page link directly to a timeline anywhere on Facebook. Be sure to follow the guidelines for any page or group you’re post to. If you have an event to share it with your community or with the public, it’s easy to include the details and to spice it up with nice images. Then, by display the event independently as a webpage, you can share it easily without it linking it to your calendar. You may have noticed that the example above was a post-event report of the actual event. Although sharing pictures from events on social media is straightforward these days, Teamup events allow you to have one place to hold all the event details together. This can be helpful for sharing event discussions, gathering event feedback, and accessing event details and images for future reference. 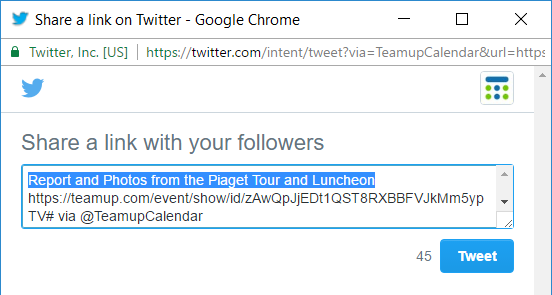 It’s possible to place links to photos posted on Facebook (right-click the time stamp of a post and select “Copy link address”) and elsewhere into your Teamup event details. So event notes, meeting minutes, event photos and event comments can all be displayed in a great layout on one web page. With Teamup, sharing events far and wide just got a little easier!